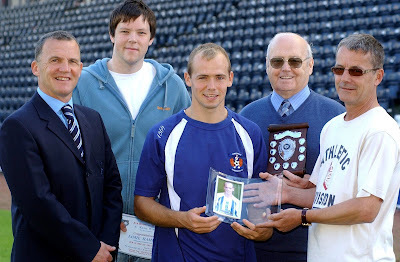 THE FOOTBALL commentary team for Ayr Hospitals Radio and KillieWorld have named midfielder Jamie Hamill the Kilmarnock Football Club Player of the Year for 2007-08. The commentary team of Mike Manley, Ryan Hunter and Ian Sanders broadcast all of Kilmarnock’s home and away games to patients at Ayr, Ailsa and Biggart Hospitals. Fans from around the world can also listen in by logging into Killieworld on the internet. At the end of each season Ayr Hospitals Radio commentary team name a footballer Player of the Year. This year’s presentation was made just before a friendly match with Coventry City earlier this month. There are currently 328 Ayrshire business stories permanently archived on this site. To locate those of most interest to you, please use the site search facility in the top left hand corner of this page. Type your search term in the white box, then click “SEARCH BLOG”.